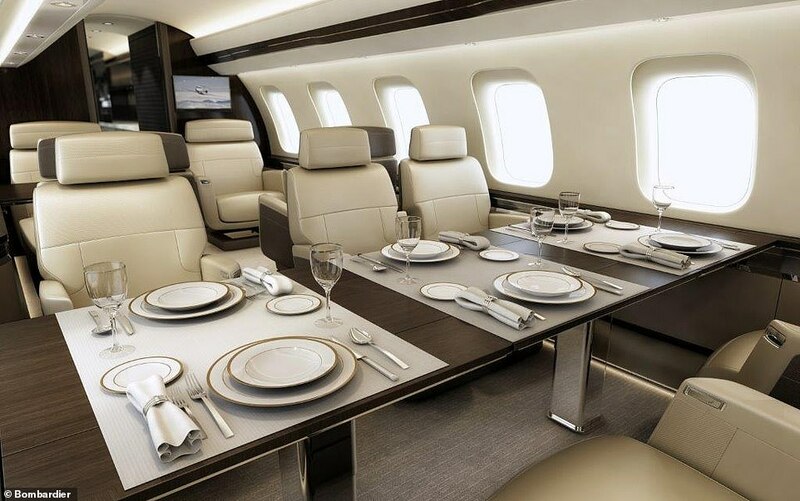 No private jet can match Bombardier’s highly anticipated $72million (£56million) Global 7500 for range – it can cover 8,860 miles without refuelling. But as these amazing new pictures show, it’s not just big on fuel capacity, it’s big on luxury. 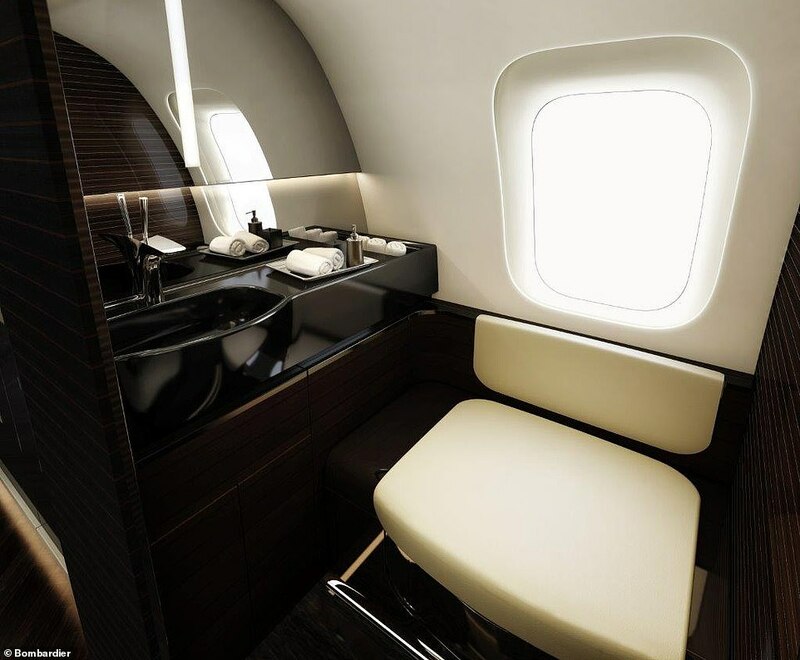 It can be customised to include a plush double bed and a stand-up shower – but comes with seats that Bombardier claims are revolutionary as standard. 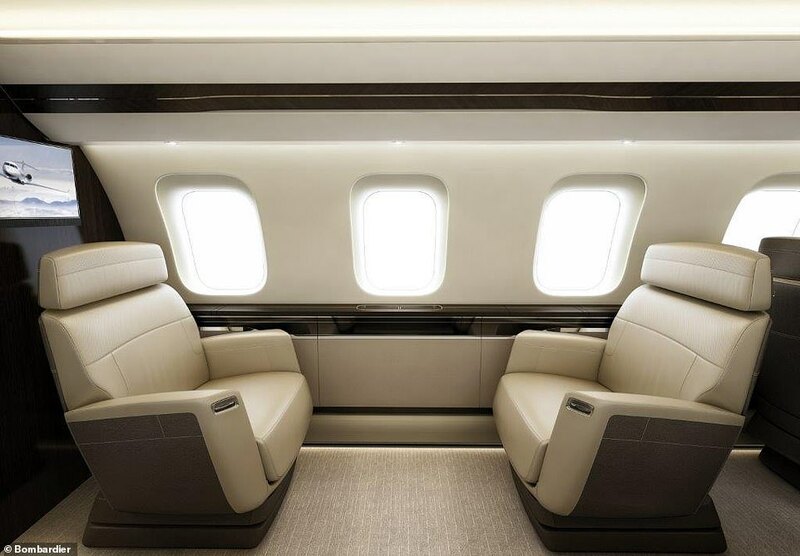 Snuggle in, if you will, to the ‘Nuage’ seat, which Bombardier says represents ‘the first new seat architecture in business aviation in three decades’ and is ‘a masterpiece of innovation and craftsman ship’, no less. Let’s take a closer look, then. The seat has a ‘patented tilt link system’ that provides a ‘deep recline position’. That’s the first eye-catching aspect of the design. Then there’s the ‘floating base’ that enables the seat to swivel with ease and a tilting headrest for ‘optimal neck support’. Entertainment on board is also top drawer. Even the standard configuration comes with a TV suite that contains a 4K 40-inch high-definition screen, high fidelity speakers and a three-seat divan. Temperature and lighting, meanwhile, is controlled by a very swish system Bombardier calls the ‘nice Touch Cabin Management System’. This incorporates touch-screen controllers in each ‘living space’ and dials that rise up from side ledges with the swipe of a hand. Even if passengers don’t lay a hand on the controls, the cabin is still an extremely pleasant place to be. 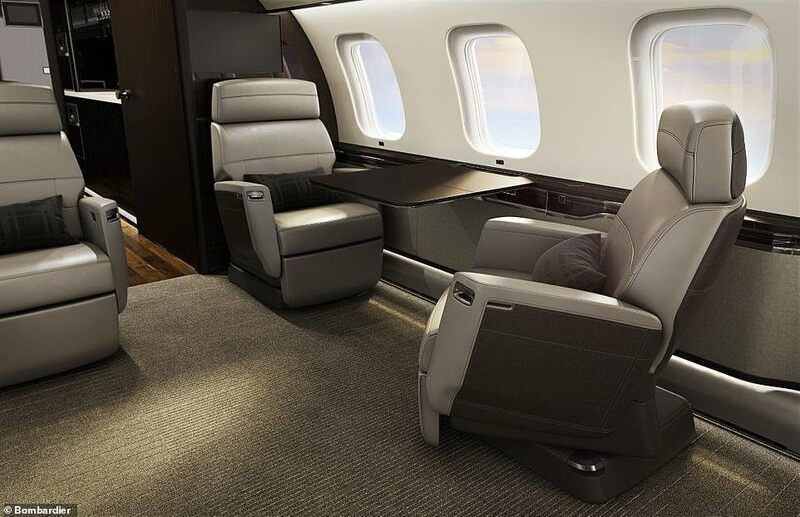 Every seat has an extra-large window and the ambient lighting simulates daylight across time zones to encourage sleeping patterns that will keep jet lag at bay. 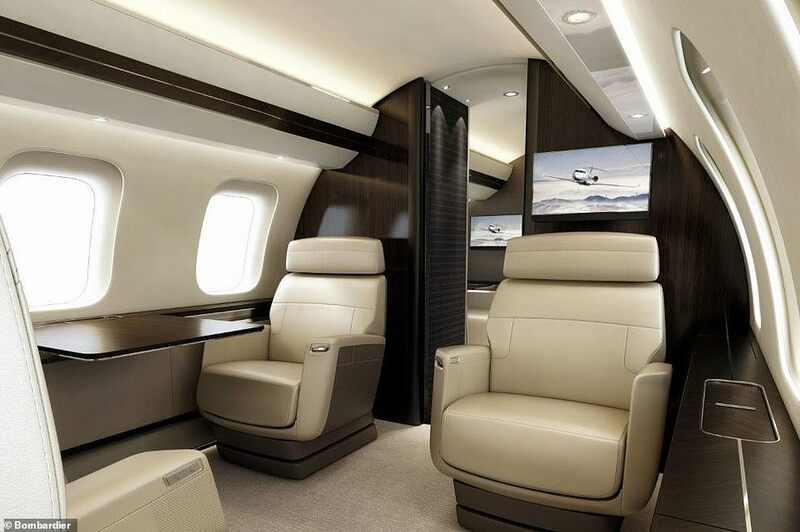 Really, it will feel like a home from home at 51,000ft (the 7500’s maximum altitude). And this feeling is helped by the sheer size of the cabin. 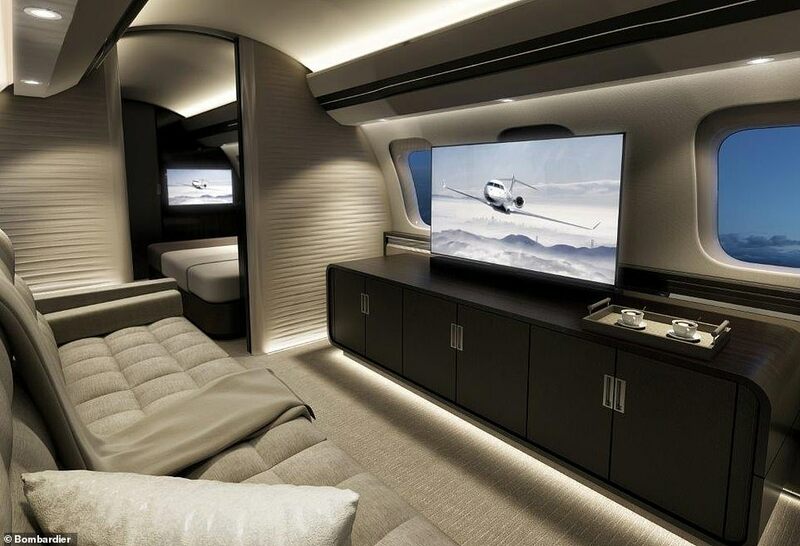 It’s claimed that this is the largest purpose-built business jet in the world. The numbers are certainly impressive. The cabin is 54ft 5in long and eight feet wide, with a ceiling height of six feet and two inches. The overall length of the plane is 111ft and the wingspan is 104ft. This floor plan features four distinct living spaces: a forward club suite, a conference suite with a table for six, an entertainment suite with a divan and adjacent credenza with large-screen TV, and a lounge suite with a divan, club seat and corner cabinet with TV. This floor plan features four distinct living spaces: a forward club suite, a conference suite with a table for six, an entertainment suite with a divan and adjacent credenza with large-screen TV, and a master suite with double bed, club seat and corner cabinet with TV. 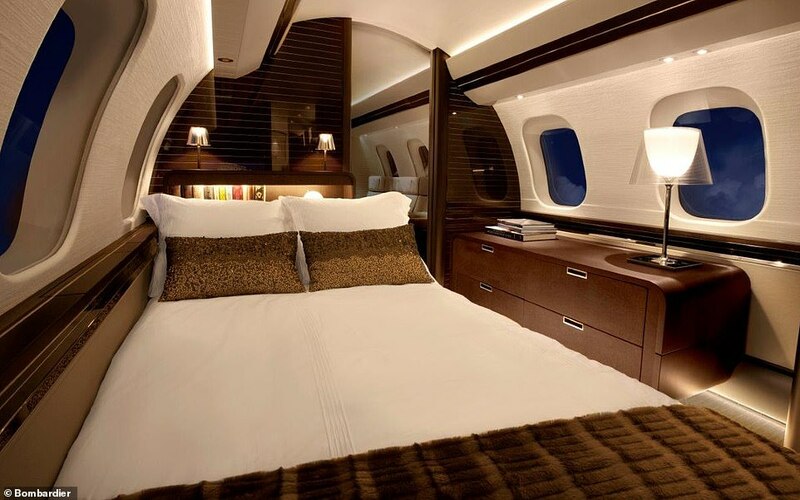 Bombardier’s designers, with all this square footage to play with, were able to produce a layout that’s an industry first – a cabin with four separate living spaces (a club suite, conference suite with a table for six, an entertainment suite and a lounge suite) and a dedicated crew suite and kitchen. In total, it can accommodate 19 passengers. The plane was type certified by Transport Canada this September and by the FAA this month. 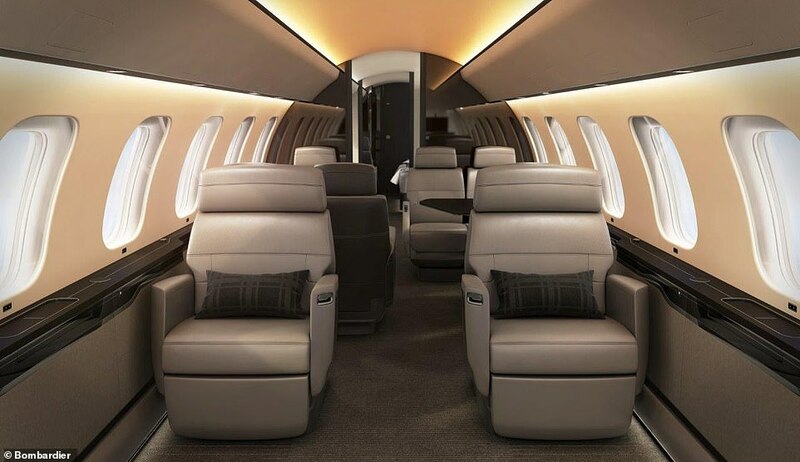 ‘This milestone is the latest accomplishment for our award-winning Global 7500 business jet, which has been exceeding expectations on every level,’ said Michel Ouellette, Senior Vice President, Global 7500 and Global 8000 Program, Bombardier Business Aircraft. 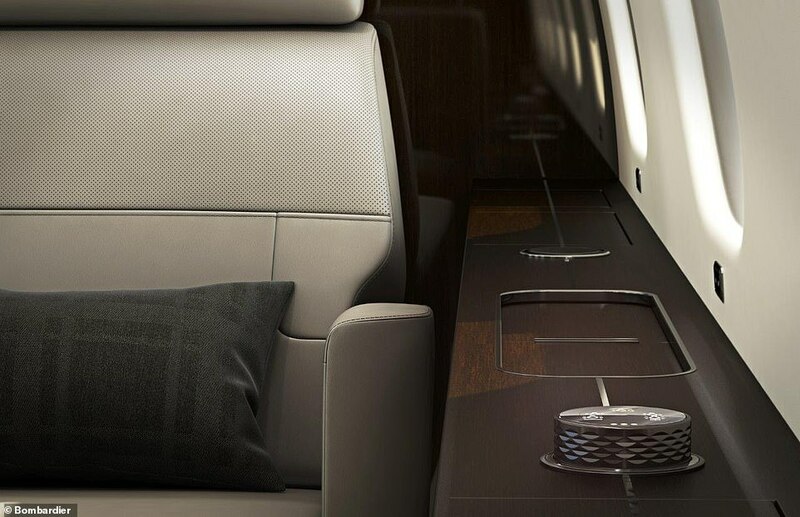 The first Global 7500s will be delivered at the end of 2018. Headquartered in Montreal, Canada, plane and train-maker Bombardier has production and engineering sites in 28 countries.